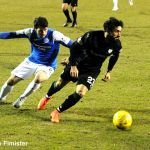 Raith Rovers moved seven points clear in the play-off places, and perhaps just as importantly, made a statement of intent, with a dominant 2-0 win over fifth place Queen of the South. 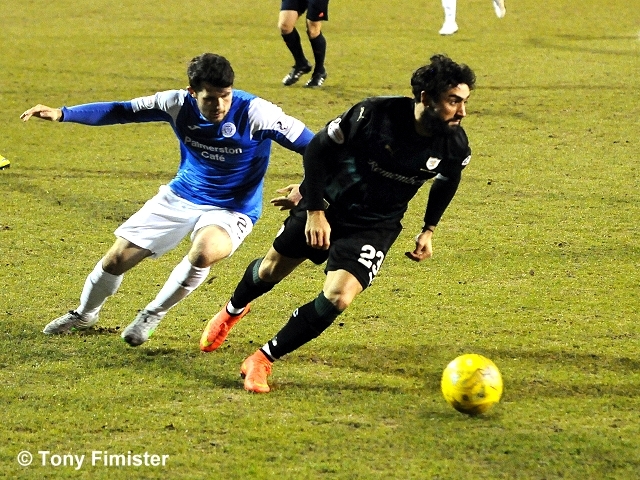 Ray McKinnon made just one change from Saturday’s team, James Craigen starting on the left-hand-side of midfield, with Harry Panayiotou dropping to the bench. 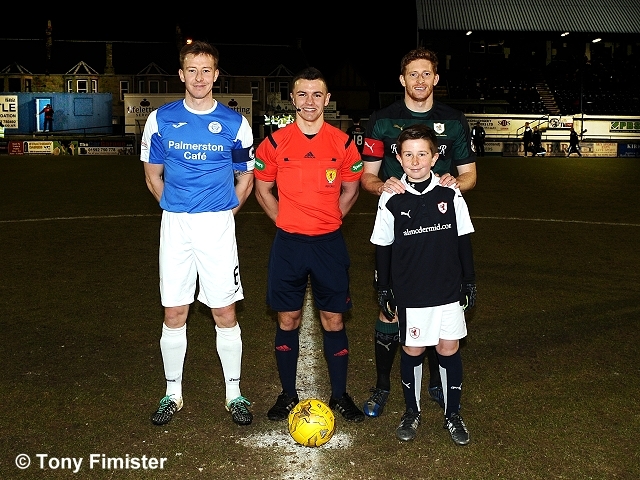 For Queen of the South, Rovers fans would probably have been relieved to see Derek Lyle and Iain Russell omitted from the starting eleven, although both were named amongst the substitutes. 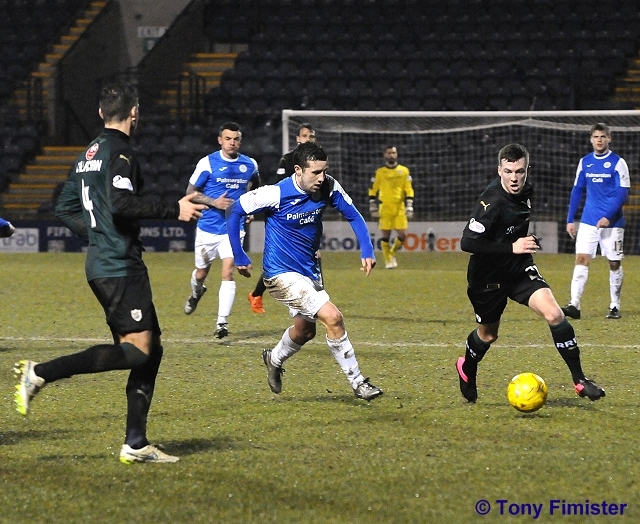 The Queens team did include one familiar face, with Ryan Conroy starting in midfield. 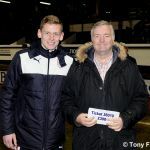 Like Saturday, Raith were quick out the blocks, although unlike the win over St. Mirren, the opening chance wasn’t taken, with Aiden Connolly dragging a snap-shot from the edge of the box wide of the target. Despite the bright opening, it wasn’t a portent of things to come, with the early stages of the match punctuated by injuries and stoppages, rather than dashing football and chances. 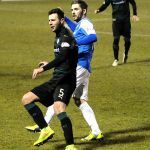 Rory McKeown was the first to require the physio on after a clash of heads, then of more concern, Iain Davidson suffered the same injury, but appeared to be out-cold, and after lengthy treatment, had to make way. 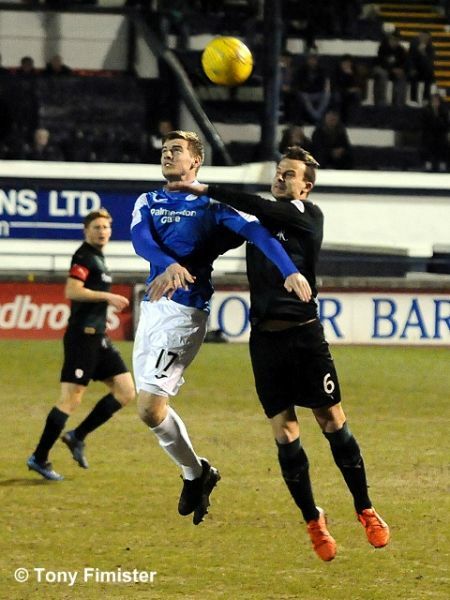 Craig Barr was his replacement in the middle of defence. 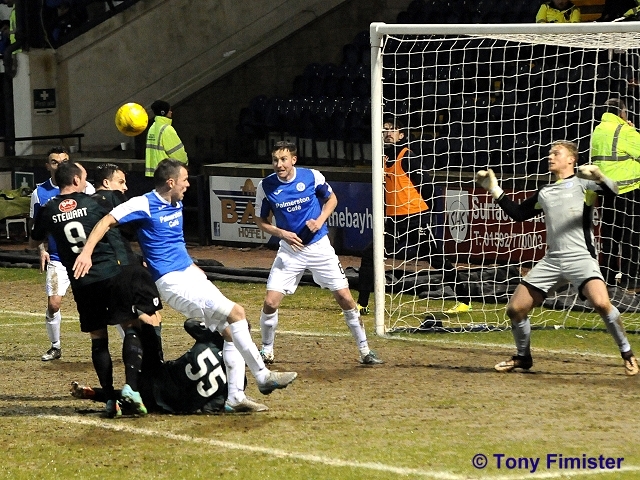 Jason Thomson was then clattered in front of the dug-outs, although thankfully he recovered sufficiently to continue. 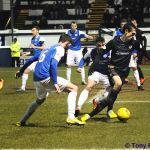 After the blood and thunder of the opening period, the game eventually started to cough up some chances, with Raith the main creators. 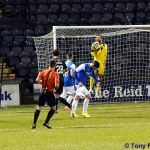 Mark Stewart was played in by Ryan Hardie, and although he reached the ball just before Robbie Thompson, his touch took the ball wide of the goalkeeper, but just too far ahead to reach before it ran out of play. 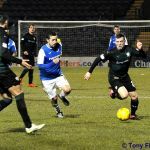 The forward wouldn’t be denied for long though, as Raith opened the scoring just after the half-hour mark, with a chance started and finished by Rovers top goal-scorer. 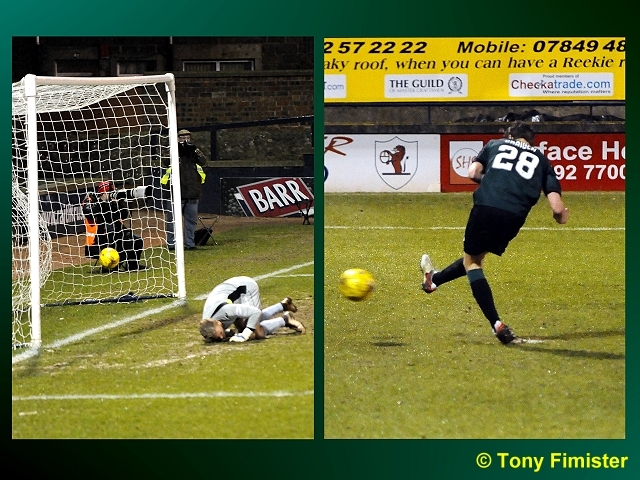 His ball from the left freed up Hardie on the right-hand-side of the penalty area, and although his chance was blocked, it fell kindly to Stewart who gratefully prodded it into the gaping net from close range. 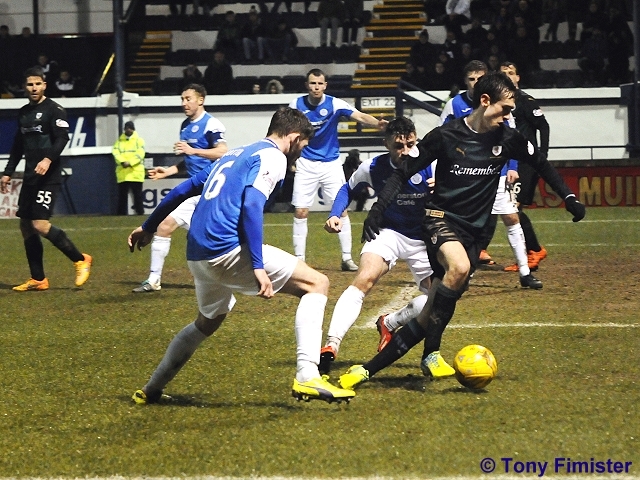 A moment later, the roles were reversed, with Stewart playing in Hardie, but the youngster was forced slightly too far wide, and his chance was eventually crowded out. 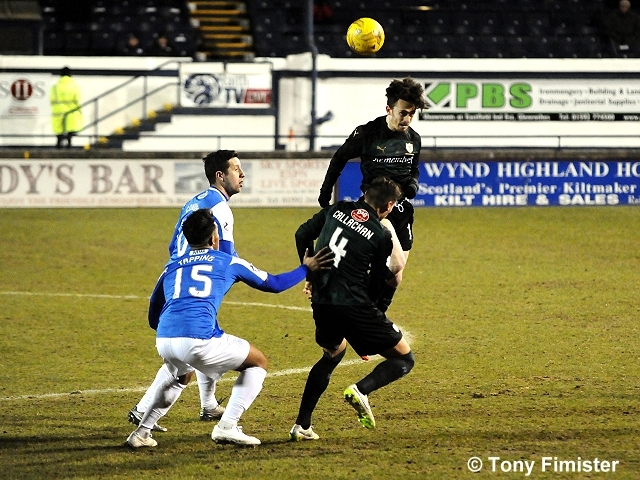 Queens hadn’t been seen much in terms of an attacking force, but they should have been level in the 38th minute. 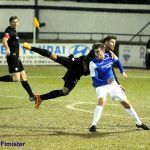 Conroy’s corner was swung in towards Cuthbert, and with the keeper struggling to claim, Andy Dowie touched it to back to Callum Tapping, but with plenty time and space, his side foot effort from just outside the box was shanked high over the bar. 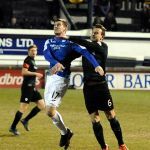 If that miss left James Fowler frustrated, then his annoyance would have been exacerbated even further, when Rovers doubled their advantage soon after. 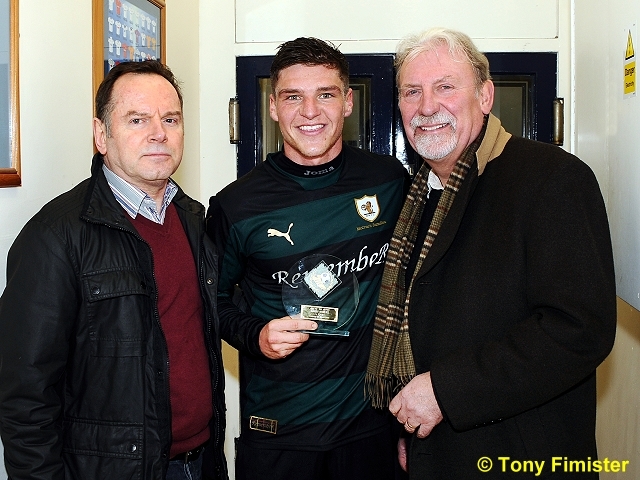 Aiden Connolly’s quick feet and directness laid the ground work, feeding Hardie inside the area. 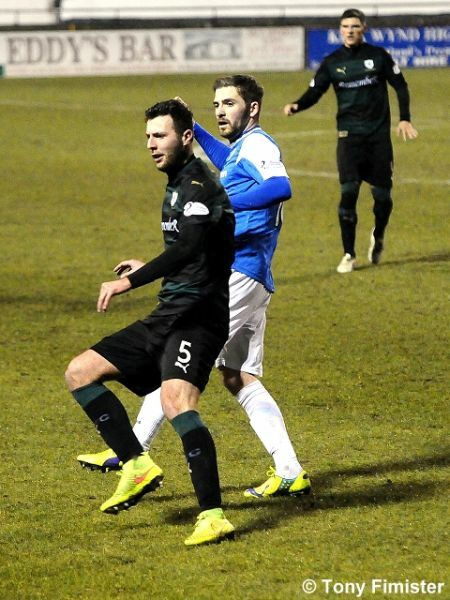 His shot appeared to meet the hand of Chris Higgins, and the referee saw the same, pointing to the spot. 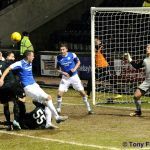 James Craigen confidently took the kick, placing it to Thompson’s left, with the young keeper electing to dive the other way. 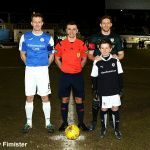 Unsurprisingly, considering how little Queen of the South had created in the first period, the second half started with Derek Lyle and Iain Russell introduced for Callum Tapping and Derek Brownlie. 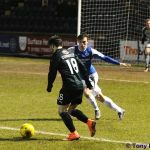 Right away, their presence appeared to lift the away side, but while they were making inroads into the Raith half, the vast majority of their possession was being played out in front of the Rovers back-four, with little or nothing coming from wide areas, or balls played in behind. 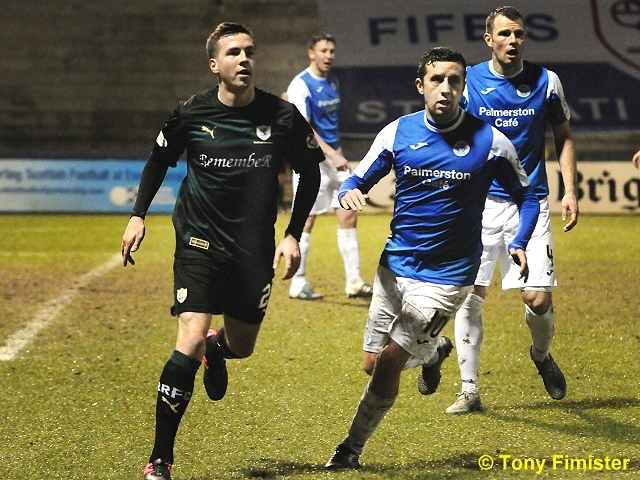 This meant that when Queens attacks were fizzling out, Raith were looking fairly nifty on the break, with the pace of Stewart, Hardie and Connolly a constant cause for concern for Fowler’s team. 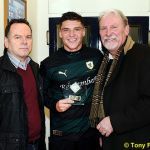 One such chance occurred in the 50th minute, when Lewis Toshney broke up an attack in the middle of the park, before playing the ball to the Hardie, whose first time lay-off found Connolly in the wide area. 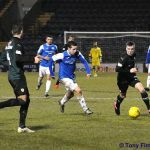 He drifted inside before teeing up the onrushing Craigen, but from a good position, the midfielder appeared to be on his heels a little, as he lifted his shot over. 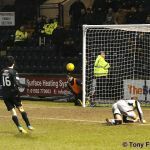 The pattern of the game now seemed set, with Queens seemingly at odds with how to make use of possession, and Raith hitting at pace. 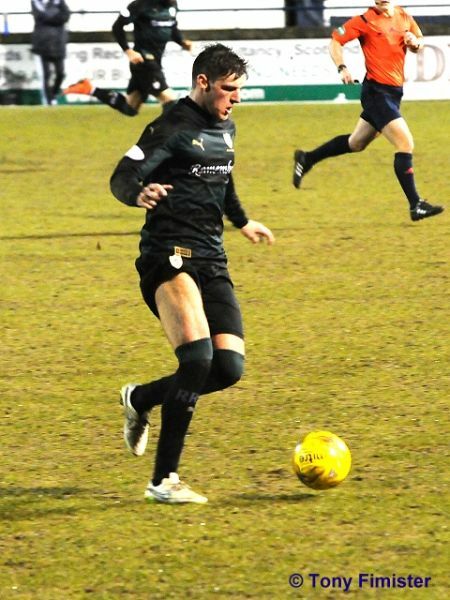 Rory McKeown was the next to spring forward, and his deep cross from the left found Stewart at the back post, but his first-time volley was deflected past for a corner. 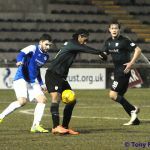 Raith continued to look the likelier to score, with Connolly sliding a perfect pass through to Hardie, but while he composed himself just as he did at the weekend, his fierce drive was deflected wide by the Queens custodian. With Rovers turning the screw, Hardie was denied again a few minutes later, when his shot from distance was beaten by the post with an unusual shovel type action from Thompson. 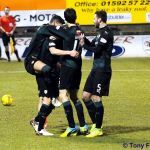 Ray McKinnon then made a flurry of substitutions, with Louis Longridge and Harry Panayiotou coming on for Connolly and Stewart, but the momentum stayed with the home side, with Callachan and Hardie again, both bringing good saves from Thompson. 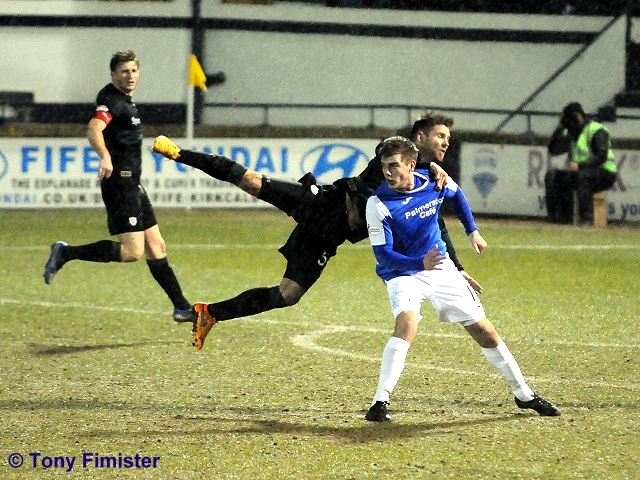 The comfortable win puts Raith seven points clear of the Doonhamers, although the Dumfries side do have a game in hand. 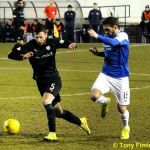 The next fixture in a hectic March is away to Alloa Athletic this Saturday. 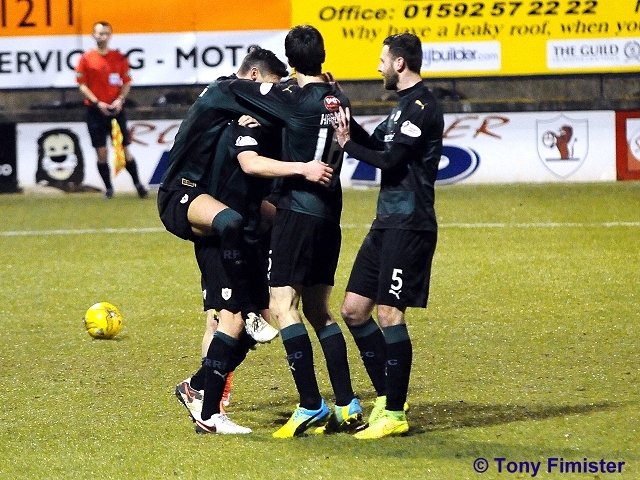 Welcome to Starks Park for a proverbial six-pointer! Davidson now down after knocking heads with that man Hilson! Davidson can't continue, so it's an early sub. 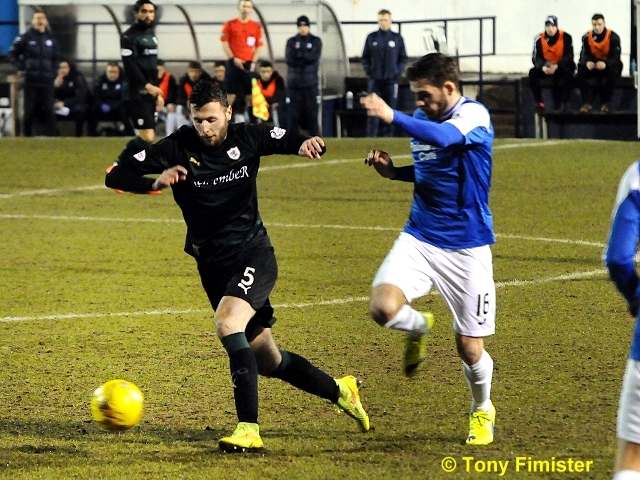 Craig Barr is coming on. Looks a nasty one, the physio and doctor are taking a while and a stretcher is on the way. 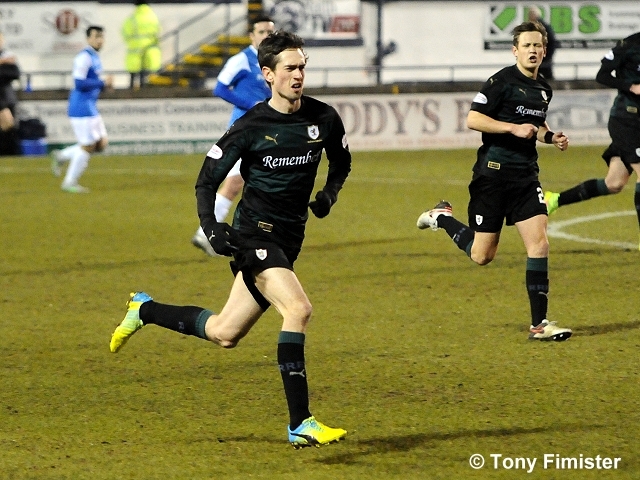 1-0 Rovers! 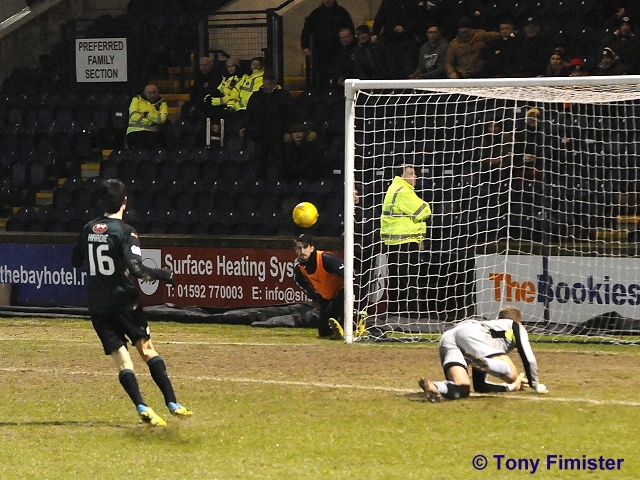 Stewart taps in after Hardie's shot was blocked on the line! 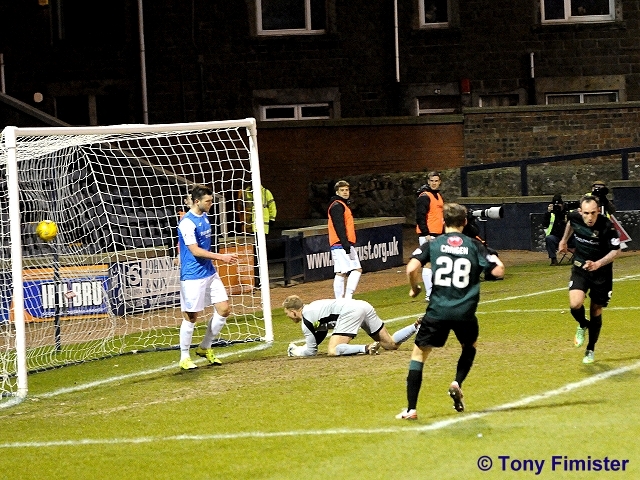 2-0 Craigen sends Thomson the wrong way! 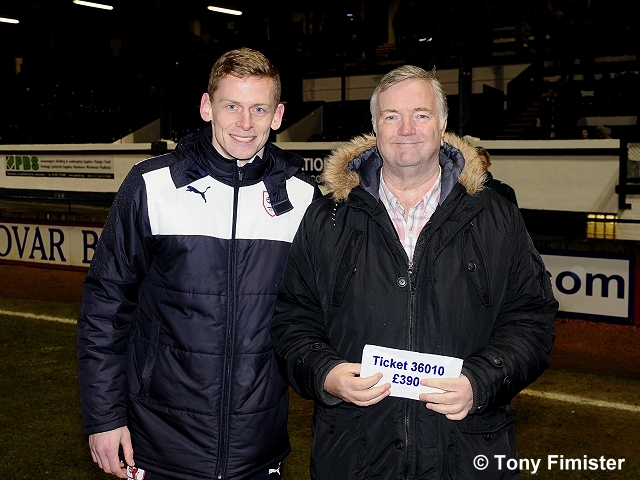 A very comfortable 45 minutes from Raith. 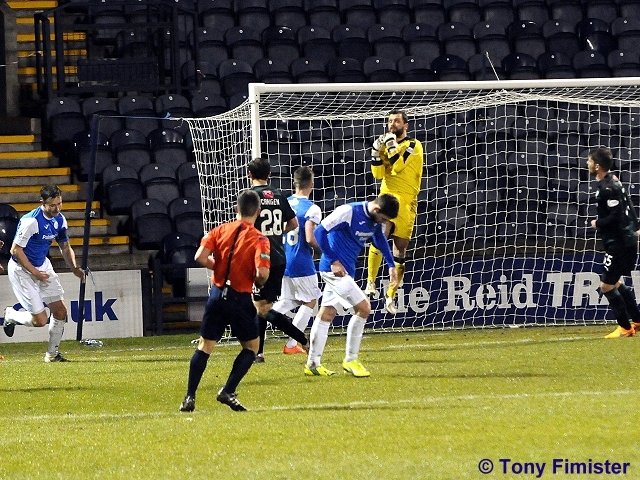 Cuthbert has been a virtual spectator, not too many chances at the other end either but Rovers are dominating the game. 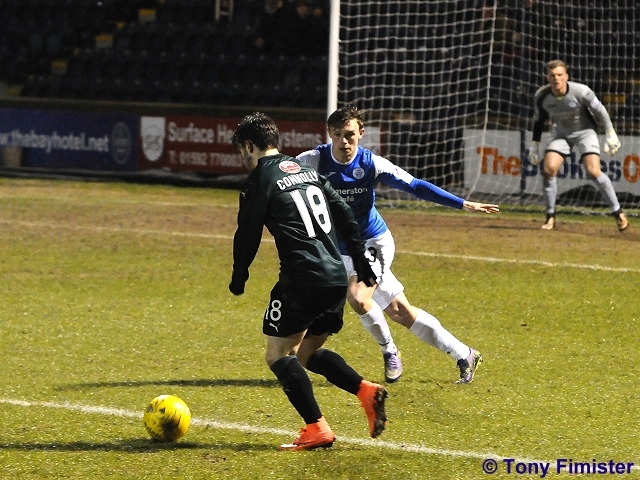 Callachan fires 35 yards over from 35 yards! 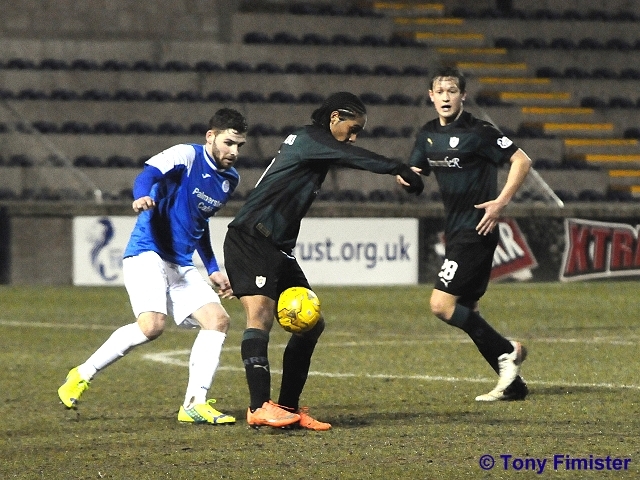 Raith go 7 points clear in 4th place with a tremendously industrious performance. 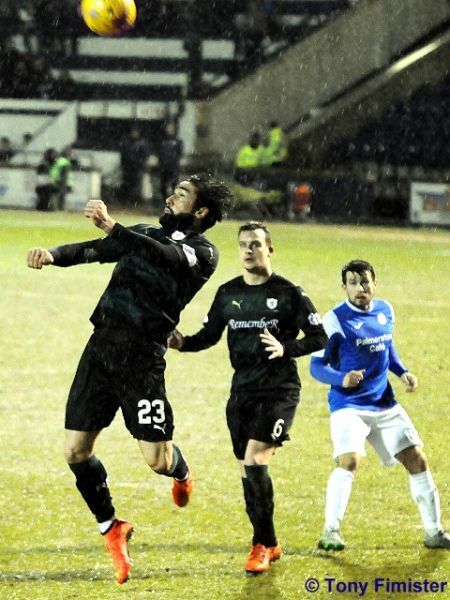 QoS not given a sniff at goal all evening. 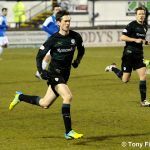 Ray McKinnon’s men saw off the challenge of St. Mirren on Saturday, emerging on top after a seven goal thriller, while Queen of the South defeated Hibernian by a goal to nil last time out. 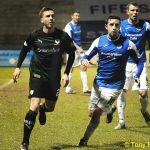 Queens weekend off meant that Raith extended their lead over the Doonhamers to four points, although James Fowler’s men have now played a game less. If the two previous encounters this term have been anything to go by, then this clash will be a close one, with Rovers claiming a narrow win and a hard-fought draw so far. 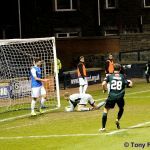 A late, Kyle Benedictus header was all that separated them at Stark’s Park in September, but the teams couldn’t be prised apart back in December, when a Robbie Thomson own-goal nudged Rovers ahead, but was pegged back early in the second-period by Iain Russell in a 1-1 draw. While games between the two are normally close, they rarely end in draws, with December’s the first match to finish all-square between the two since April 2010, a run of 17 matches. 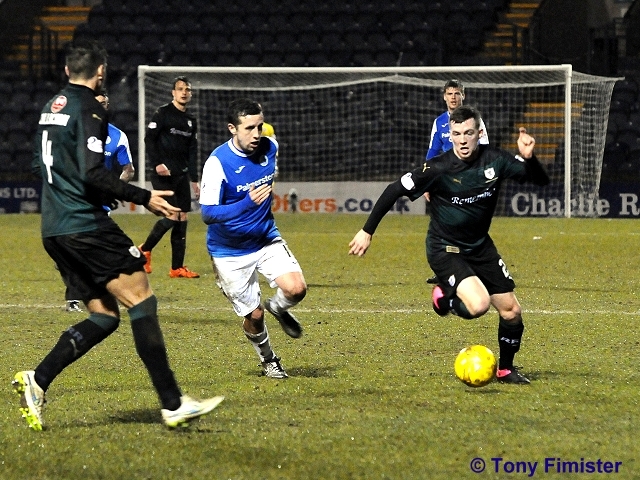 Rovers will be looking to sustain their fine record against teams who sit below them in the table, with just two defeats in 17 so far, however, while goal-scoring hasn’t been a problem over the last few weekends, they may find it tough to replicate that against Queens, a team who have the Championship’s second best defensive record on the road this term, conceding just 11 goals in 11 games. 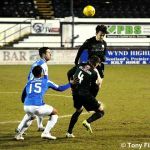 The recent head-to-head record is almost level, with Raith racking up five wins to Queens four from the last ten meetings. Tuesday night’s match referee will be Nick Walsh.